The “Alfa” in Alfa Romeo is an acronym: Anonima Lombard Fabbrica Automobili, originally rendered A.L.F.A. The company was actually founded in 1906 by the French entrepreneur Alexandre Darracq as S.A.I.D. (Societa Anonima Italiana Darracq). It changed its name three years later following its purchase by an Italian consortium eager to disassociate themselves from the colossal commercial and technical failure of S.A.I.D.’s early cars. The “Romeo” came from industrialist Nicola Romeo, a one-time mining engineer who purchased the ailing concern in 1915 and installed himself as its managing director. Sic transit gloria mundi, though, particularly since it seldom pays the bills. Throughout its history, Alfa has suffered a variety of serious financial crises, and the company would have folded in the early years of the Depression were it not for a bailout by the Italian government. The end of the second world war again found Alfa in dire straits. The firm’s factory in Milan had been bombed and left in ruins and both customers and business were thin on the ground, particularly since the military contracts that had sustained Alfa in the past were now forbidden by treaty. The company nonetheless managed to resume racing, and in 1950, Alfa Romeo rolled out the 1900 sedan, a competent if not entirely inspiring new production model. 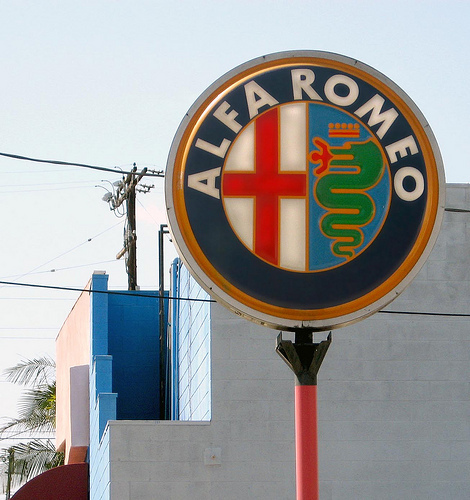 Although the 1900 sold better than any past Alfa, its total sales, some 21,304 by the time production ended in 1959, were far below the company’s aspirations of 12,000 cars a year. In 1952, two years after the launch of the 1900, Alfa engineers were busily preparing a smaller, cheaper companion model that they hoped would boost their overall sales volume. Like the 1900, the new car was designed by Orazio Satta Puglia, a brilliant engineer who had joined Alfa before the war. The new model would be called Alfa Romeo Giulietta, after Shakespeare’s Juliet Capulet. The Giulietta was a good design, with a number of advanced technical features, but lackluster sales of the 1900 meant that Alfa lacked the funds to put the new car into full production. Being short on cash is a potentially fatal condition for any company, particularly in an industry as heavily dependent on new product development as the auto industry. It’s a classic catch-22: if your existing models sell poorly, you may not be able to afford to develop new ones, but the longer the current cars remain in production, the less competitive they become. Only a handful of cars in the postwar world (such as the Volkswagen Beetle, the Mini, and the Porsche 911) have managed to survive for more than a few years without at least a significant update. A shortage of development funds is, therefore, exceedingly dangerous — although it can sometimes stimulate the creativity and ingenuity of engineers and managers. Alfa management decided that the most workable way to fund production of the Giulietta was a bond issue: persuading investors to finance production with the promise of future repayment at a competitive rate of interest. To add a little spice, 200 investors would be selected at random to receive one of the new cars, making the bond issue essentially a lottery. Italians quickly queued up for the opportunity to be one of the first to own the new small Alfa. This is a 1958 Alfa Romeo Giulietta Spider, one of the last of the original, 750-series, short-wheelbase line, which looks very similar to later 101-series Giuliettas, but has many dissimilar, non-interchangeable components. The lovely nose styling is timeless, although it’s vulnerable to shunts and replacing a lot of the brightwork is expensive. Unfortunately for Alfa Romeo, developing new models can be time-consuming as well as expensive and delays are common. Even if a design is fundamentally sound, there can be any number of teething problems, not to mention the other challenges facing long-term business development: supply issues, labor disputes, inflation, et al. The inevitable result was that the Giulietta was more than fashionably late. Were it a privately funded effort, this would have been unfortunate, but probably manageable. The bond issue, however, meant that there were thousands of impatient investors, growing increasingly restless. Worse, when it came time for the drawing of winners of the lottery, there were still no cars for them to claim. By 1953, there were murmurs in Italian newspapers about fraud. To our knowledge, there was no actual evidence of fraudulent intentions on the part of Alfa executives, but, since Alfa was partly owned by the Italian government, the rumors were embarrassing. Something would have to be done to placate investors and the press. Alfa’s solution was to commission an independent coachbuilder to produce a few hundred custom-bodied coupes, using early-production Giulietta running gear. In this way, they could satisfy the angry lottery winners, earn some positive press, and buy a little more time to get the sedan into production. Italy had no shortage of coachbuilders in those days. Labor was cheap in postwar Italy, and a variety of independent carrozzerias kept themselves in business building small runs of bodies for automakers like Ferrari, doing consulting and outsourcing work for bigger companies and handling the occasional private commission. In the fall of 1953, Alfa’s new technical manager, Rudolf Hruska, provided two of the Giulietta development prototypes to Mario Boano of Carrozzeria Ghia and Nuccio Bertone of Carrozzeria Bertone, asking for proposals for a limited-production coupe based on the Giulietta chassis. The request specified a production run of up to 1,000 cars, with the first prototype to be ready in time for the 1954 Turin auto show. Of the two resultant proposals, Hruska preferred Bertone’s, which had been penned by designer Franco Scaglione. However, there was serious question as to whether Bertone’s small works would be able to produce the requisite number of cars. Bertone had only a tiny workshop and a handful of employees, who had to hand-form body panels on wooden bucks — not an arrangement conducive to large-scale production. Hruska, Boano, and Bertone planned to compromise by setting up production as a joint venture between Bertone and Ghia, Bertone producing the prototype and Ghia the rest, using Scaglione’s design. Unfortunately, Mario Boano subsequently made a contentious exit from Ghia, which put paid to the joint venture. In the end, Bertone’s workshop would have to produce the cars despite the firm’s problematic lack of space and manpower. Bodies were to be built at the Bertone works and then shipped to the Alfa factory to be mated with the chassis. The Alfa Romeo Giulietta’s steering is a comparatively primitive worm-and-roller system, but it’s light, accurate, and communicative, making the Spider entertaining to drive. Later-production Giuliettas had disc brakes, but the finned drums are more than adequate for the Giulietta’s modest weight. The first hand-built coupe — dubbed Alfa Romeo Giulietta Sprint — was ready for Turin as planned and proved to be a hit, the company reportedly receiving more than 3,000 orders during the show. As with the lottery, however, there were still no cars to sell. Bertone managed only to complete only a dozen coupes by the end of 1954, even as Alfa was seeking to increase the total number of coupes from 1,000 to 6,000. Hruska pressured Bertone to step up production, which required the tiny coachbuilder to make a major investment in staff and infrastructure. Despite the rocky start, Carrozzeria Bertone gradually increased their production speed from a meager four cars per day to about 34 per day by 1958. Their efforts paid off, for the completed coupes sold very well despite prices more than 25% higher than the ordinary Giulietta sedans. The Giulietta sedan (“Berlina,” in Alfa parlance) had by then finally gone into production, making its debut in April 1955. Although inevitably somewhat dowdy compared to its sleek coupe sibling, the Berlina was a handy, fun-to-drive compact car that eventually accounted for 177,690 sales through 1963. Achieving that success had been a rocky road, but the Giulietta was the mass-market hit that the company desperately needed. Unlike many British roadsters of its era, the Alfa Romeo Giulietta Spider has roll-up side windows and a proper folding top, increasing its livability at the cost of a slight increase in overall weight. In hopes of recouping some of his considerable investment in new facilities and staff, Bertone proposed a roadster version of the Giulietta, also styled by Scaglione. Alfa management agreed that there would be a market for a roadster, but they rejected the Scaglione proposal and turned instead to Pininfarina for an alternative proposal. Ironically, Farina had admired Scaglione’s design for the coupe, and so the final Pininfarina-designed roadster so closely complemented the coupe that it looked more like a Bertone design than it might have had Scaglione designed it himself. 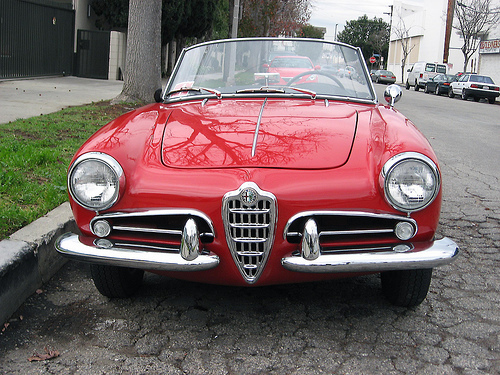 The roadster, dubbed Giulietta Spider, debuted at the 1955 Paris auto show, again to a very favorable public reaction. The styling firm of Sergio Battista “Pinin” Farina, Carrozzeria Pininfarina, took its name from an amalgamation of the founder’s nickname and surname. 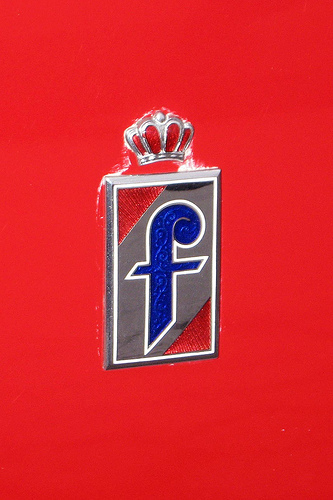 Farina formally changed his name to “Pininfarina” in 1961. Pininfarina styled the Spider after Alfa rejected a proposal by Bertone, although its design closely follows the lines of the Bertone coupe. 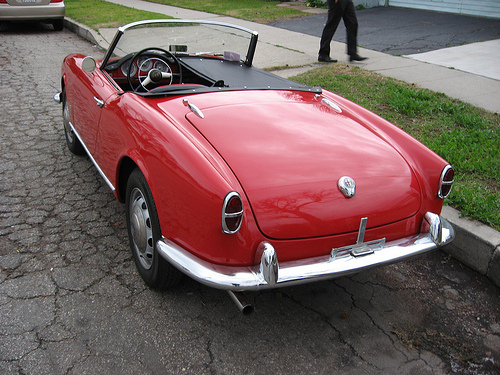 The Giulietta Spider was several inches shorter than its mates, riding a shorter, 86.7-inch (2,202mm) wheelbase. The Spider was somewhat heavier than the Sprint, tipping the scales at around 1,900 pounds (860 kg). Like all Giuliettas, the Spider had a conventional independent suspension in front with a live axle in the rear, well controlled with twin trailing arms and an unusual locating bracket on the differential housing, an arrangement that Alfa would use to good effect well into the 1980s. Brakes were finned aluminum drums with cast-iron liners, offering ample stopping power and resistance to fade. 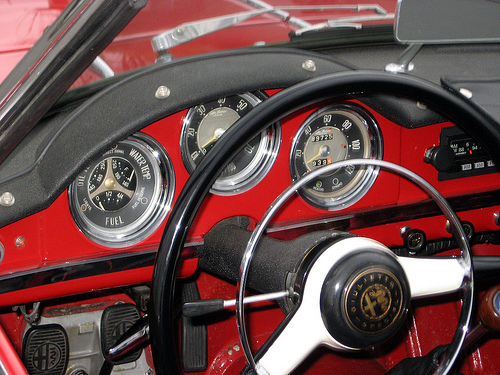 A 7,000-rpm tachometer was standard and essential on the Giulietta Sprint and Spider — the little engine loves to rev and it’s easy to exceed the redline. Curiously, the secondary instruments are labeled in English, even though the under-hood fittings are labeled in Italian. Under the hood was Alfa’s 750-series inline-four, a remarkably sophisticated little engine based on that of the Alfa 1900. The 750-series engine had an aluminum block and head with dual overhead camshafts and hemispherical combustion chambers, all quite exotic features for the time. Although it displaced only 1,290 cc (79 cubic inches), in the Sprint and Spider the 750 engine made 80 horsepower (59 kW) at 6,000 rpm. This was enough to push the Spider from 0-60 mph (0-97 km/h) in less than 15 seconds and on to a top speed of 103 mph (165 km/h), not bad at all for the mid-1950s. It was also comparable to the contemporary Porsche 356, which was far more expensive. Like the Porsche, the Giulietta could also return remarkably good gas mileage in gentler driving. If that wasn’t enough, in 1956 Alfa added the Veloce, which pushed the 1,290 cc (79 cu. in.) 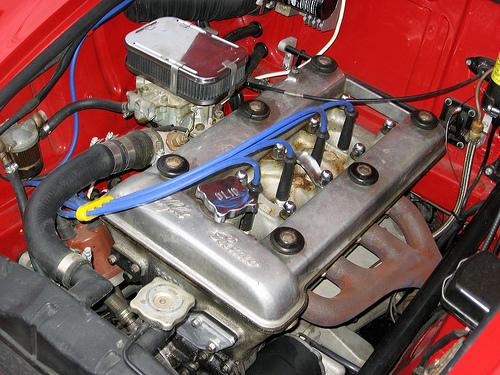 engine to 90 hp (67 kW) via increased compression and a pair of two-throat Weber carburetors. (Veloces also had various weight-saving measures, although their larger fuel tanks made them slightly heavier than the standard cars.) A Giulietta Sprint or Spider Veloce cut nearly two seconds off the 0-60 mph (0-97 km/h) times and pushed top speed to an official 112 mph (180 km/h), which could be exceeded if you were willing to rev the engine past its redline. Dual overhead cams, hemispherical combustion chambers, aluminum block and head — this engine would still be exotic by the standards of 25 years later. In the Alfa Romeo Giulietta Spider and Sprint it produces 80 horsepower (59 kW), putting it a little over the “one horsepower per cubic inch” (61 hp/L) figure trumpeted by Chevrolet around that time. The owner plans to remove the stock engine and four-speed for a later 1,962 cc (120 cu. in.) engine and five-speed, putting the original powertrain in storage; this is a common swap that gives a useful boost in both power and flexibility. Although the Giulietta Spider and Sprint were significantly more expensive than the Berlina and only marginally faster in a straight line, all Giuliettas were great fun to drive and they remain so by modern standards. They leaned more in turns than some sports cars of their era, but they stuck well, with none of the tail-happy antics of a contemporary Porsche, and had light, communicative steering. They were not blazingly fast, even in their day, but the engine has an appealing sound, although no Giulietta was quiet. Surprisingly for Italian cars in general and Alfas in particular, the Giulietta proved to be relatively reliable. The engines were sturdy, although not without their quirks (for example, too-infrequent driving can cause the head gasket to pack it in, while prolonged explorations of the redline can burn valves). The general level of mechanical reliability was quite high. So too is the assembly quality — these were hand-built cars, benefiting from a good deal of Olde World craftsmanship. The Giulietta’s inevitable Achilles’ heel is corrosion; they were built without any thought of rust-proofing and their complex, welded body structures are prone to rot in a variety of creative and expensive ways (although much the same is true of Porsches and Jaguars of that era). It is with some amusement that we note that, discounting rust, the Alfa’s major reliability shortfalls are in its electrics (starter, wiring, generator), which were supplied by that well-known and notorious British firm, Joseph Lucas, Ltd., whose founder English car lovers have dubbed “the Prince of Darkness.” So much for national stereotypes. The Giulietta Sprint remained in production until 1964, the Spider for another year after that. In 1959, the Spider received many incremental changes, earning a new type number, 101. The wheelbase of the post-1959 cars was stretched by about 2 inches (50 mm) and they gained fixed vent windows and a number of cosmetic and mechanical refinements. At the same time, both Sprints and Spiders received a stronger engine block and a more robust transmission with Porsche-style synchronization. From 1962, they got the new 1,570 cc (96 cu. in.) engine from the Giulia sedan, which had 92 hp (69 kW; 112 hp/84 kW in Veloce trim) and a five-speed gearbox; owners often substitute these for the earlier 1,290 cc (79 cu. in.) engine and four-speed. Total Spider production was just under 25,000. Alfa Romeo has continued in much the same pattern of alternating heroism and absurdity, producing a number of compelling but often deeply flawed cars and a lot of entertaining industrial drama. The Italian government finally lost its stomach for the business in 1986, leading to a buyout by the FIAT Group, which still owns Alfa today. There currently are ambitious plans to more than double Alfa’s volume by 2010, including a return to the U.S. market around 2009, but, given Alfa’s track record, there will no doubt be comedy yet to come. It would hardly be Alfa without it — nor, if you may forgive us the stereotype — would it be so quintessentially Italian. Our sources included Griff Borgeson, “The Saga of the Giulietta Sprint,” Road & Track Vol. 16, No. 4 (December 1964), pp. 41–44; our conversation with the owner of the red car on 26 January 2008; the Cars from Italy Giulietta page (n.d., www.carsfromitaly. net, accessed 26 January 2008); Mike Covello, Standard Catalog of Imported Cars 1946-2002 (Iola, WI: Krause Publications, 2001); David Owen, Alfa Romeo: Always with Passion (Haynes Classic Makes) (Sparkford, England: Haynes Publishing, 1999); Ray Thursby, “Precious Gems: The 1954-65 Alfa Romeo Giulietta and Giulia Story,” Collectible Automobile Vol. 19, No. 6 (April 2003), pp. 58-65; “Road Test: Alfa Romeo Giulietta Spyder,” Road & Track April 1956; “Road Test: Alfa Veloce: a car has no business being so desirable,” Road & Track March 1958; “Giulietta Sprint,” Road & Track March 1961; and Hansjoerg Bendel, “Alfa Sprint Zagato,” Road & Track December 1961, all of which are reprinted in Road & Track on Alfa Romeo 1949-1963, ed. R.M. Clarke (Cobham, England: Brooklands Books Ltd., ca. 1985). Having owned three Alfa Spiders over the decades ( currently a 71 occupies the garage ), the romance lives on for me. There’s a thoughtfulness in Alfa designs and a beauty as well. There’s an old joke that the Brits make their sports cars out of whatever bits were lying around; the Germans design to aircraft standards making them both expensive and difficult to repair; and the Italians design every part to be as beautiful looking as possible and then figure out how to make them work. Like most jokes there’s a lot of truth in it. A Spider is a joy to drive when you’re winding that all-aluminum dohc hemi-headed engine to 6,000 rpm (or beyond) as you pull out of a curve with the wind whipping through your hair. If you haven’t driven one, you ‘re missing something in your life. 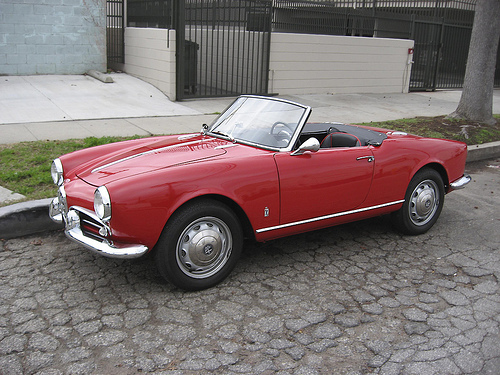 A 1964 Giulia Spyder was my first new car and even today, many cars later, it remains a wonderful memory for its elegant design and simplicity. The electrics in my car were Marelli which were no more reliable than the Lucas parts of the era. After three or four voltage regulator failures, I finally solved the electrical problems with Delco parts. I’m a Porsche fanatic, but I have to admit that the Alfa Giulietta is one of the most beautiful designs ever made. I’d love to find one of these convertibles, or even one of the coupes to buy and restore. The engine is a jewel and the body is an inspiration! Regarding the Giulietta and subsequent models that featured the Alfa Romeo Twin-Cam engine, were any lower displacement versions below the 1290cc unit ever considered for existing models or shelved projects (13-61 and 103 prototypes aside)? Another question that comes to mind is why did Alfa Romeo develop the Alfasud Flat-4 when they already had the Twin-Cam engine? The Alfasud was a clean-sheet design and very different from past Alfas, so maybe they felt the need for a clean-sheet engine. Why a flat-4? Smoothness, low center of gravity, a short engine for efficient packaging with that drivetrain layout. Same reason the early-60s Ford Taunus got a V-4, as we’ve discussed in the Ford Fiesta history. I assume packaging was probably a significant consideration, yeah. Guess that would be the case, though while the Flat-4 was a great engine in retrospect it does seem to have been a wise decision for Alfa Romeo to be producing two different engines given its later financial problems unless there were plans to have the Flat-4 unit power more models. The Tipo 103 prototype demonstrated that it was possible to fit the Twin-Cam engine (or at least some variation of said unit) into a FWD car. Is it know whether any destroked versions of the 1290cc Twin-Cam engine were developed for existing models or prototypes (outside of the Tipo 103)? Apologize for the typos in the last two posts. Meant to say that it was not a wise decision for Alfa Romeo to develop two different yet similar sized engines at the lower end of the range. Guess it is not yet known whether destroked versions of the 1290cc Twin-Cam unit were investigated by Alfa Romeo. Again, I’m only familiar with the outlines of the Alfasud project, so I’m reluctant to comment from a position of ignorance. However, it’s worth noting that there are often more considerations than just displacement and whether a given engine can be wedged into a specific application. For instance, a major consideration is production capacity and production facilities. Sometimes, existing engine production lines aren’t adequate for the intended production volume or there’s some compelling advantage in shifting production (or setting up separate production) elsewhere. Tooling costs are usually a much bigger investment than design costs, so if it’s necessary to set up a different factory or assembly line, it becomes tempting to tinker with the configuration. That’s how GM divisions ended up with so many engine families of similar size — each division needed so many engines that for many years, it made sense for the divisions to build their own, at which point they could just as well design their own as well. Also, a manufacturer’s willingness to invest in new designs — and new tooling for new designs — depends greatly on how many copies they expect to sell. If you figure you can make 300,000 units a year, it’s worth developing an engine specific to that application, especially if it seems like it will provide some salable advantage or cost less per unit to build. The Alfasud (literally “Alfa south”) was built where it was in large part for political reasons–to create jobs in a perennially depressed region. I don’t know if the engine was built in the same factory as the rest of the car, but it would make sense from the standpoints of both production efficiency and job creation. To go off on a tangent, the Hillman Imp was built where it was for similar reasons. In that case, sizable subassemblies got shuttled between the Linwood, Scotland, Imp plant and other Rootes plants. The strict economic case for the arrangement was pretty weak. Much the best way, to grasp the essence of the Alfasud’s design, is to take a drive in one. Yes, I do know, not many left now ! When these cars were current, my wife and I, living in the UK, had a 1.5 Ti saloon. The nimble, fluid way in which all ‘Suds drive was really special then, and would still feel good today. The flat four layout, with its compact engine low down at the front, was inherent to the car’s concept and its behaviour. With an upright 4 cylinder across the front, it would have been a much different car. As we know, Rudolf Hruska and his team had the advantage (as it seemed) of the proverbial clean sheet of paper – and in terms of the design, they hit it out of the park. IF ONLY the cars had been made properly….. but that’s a different, very painful subject, both for Alfa, and for legions of Sud owners. And when Aaron writes the definitive story of the Sud, it will have to be dealt with !